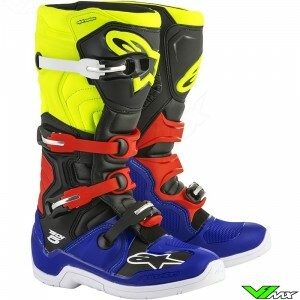 The Alpinestars Tech 5 are advanced motocross boots for a competitive price. 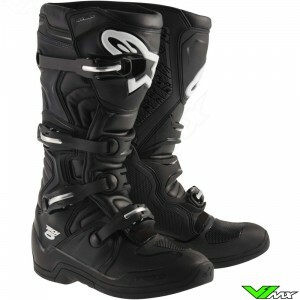 It contains many design features of the more expensive Alpinestars boots in an affordable package. Below you can find all the colors which are currently available. The reinforced nose provides excellent protection for the toes. It is made of impact resistant TPU material. 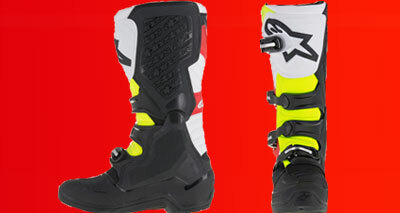 Alpinestars has paid a lot of attention on features that will help new and novice motocross riders. An example of this is the low nose profile with grip pattern. This helps riders by making shifting gears easier, because it’s easier to get your foot under the gear pedal. 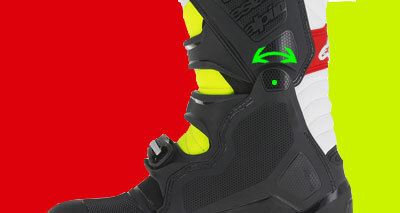 A large shin plate with Alpinestars logo protects against impacts. The shin plate is attracted by a buckle, in addition there is a large area of Velcro behind this plate for a perfect closure. Protective areas are also applied at the rear for maximum protection in the event of a rear collision. 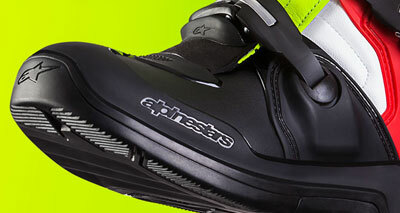 In addition, the Alpinestars Tech 5 has an innovative microfiber profile, which is very durable and light. 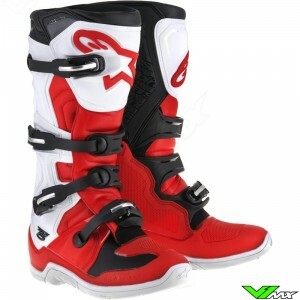 To provide good support, it is equipped with a hinge system on the medial side of these Alpinestars motocross boots. The hinge system provides a combination flexibility an protection. Flexibility is important for a comfortable ride, but also for the performance of motocross riders on track, where you have to move quickly on the bike. The biomechanical hinge system of the tech 5 provides excellent levels of support. The medial side the boots has a very flat design. This feature in combination with a grip pattern helps motocross riders, because it offers more grip and control over the dirt bike. There are no protruding pieces on this parts, to prevent you from catching on to somewhere. 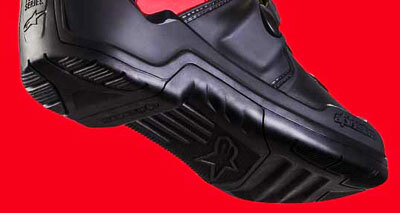 Alpinestars designs the construction using the latest techniques. This is reflected in, among other things, the low weight and good flex zones. 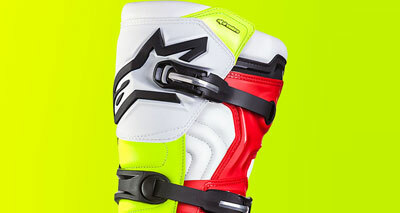 Alpinestars has incorporated no fewer than 4 buckles into the design. The advantage of this better force distribution of the closures and a better connection around your foot, ankle and lower leg. 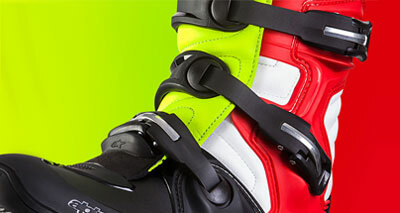 The buckles are made of an impact resistant combination of aluminium and plastic. The self-aligning design with memory is great, because it offers and easy-to-use closure. 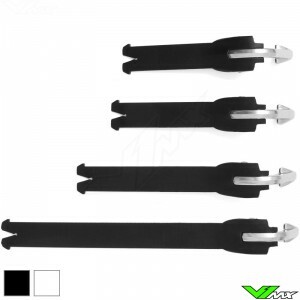 The buckles are self-cleaning because of the unique open design. 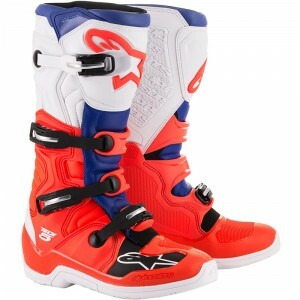 Soles are one of the most important parts of motocross boots because it is the main connection with your motorcycle. The Tech 5 sole is designed to provide good damping and thus improve comfort. Soles must also be durable so that you can use the boots for long time. Alpinestars has developed the perfect compound that will not only absorb shocks, but also gives excellent wear resistance. The bottom part is made from a single piece of material, which makes it strong and lighter. Do you have a question about the motocross equipment or about placing an order? Feel free to contact our customer service. We are happy to help you order and choose the right motocross gear.